Shipping containers are a great building block for structures because they are self-supporting units complete with floor structure, walls, and a roof. These container units can be utilized as individual self-contained units or as building blocks for a larger structure. Shipping containers can be sourced inexpensively due to the surplus of container units available throughout areas of the United States, and are a great way to re-purpose manufactured containers that would otherwise sit unused rusting away. Shipping containers are typically 8′ wide by 8′ tall and come in two lengths, 20′ and 40′. If additional height is needed, high cube containers are also available that are 9′-6″ tall. 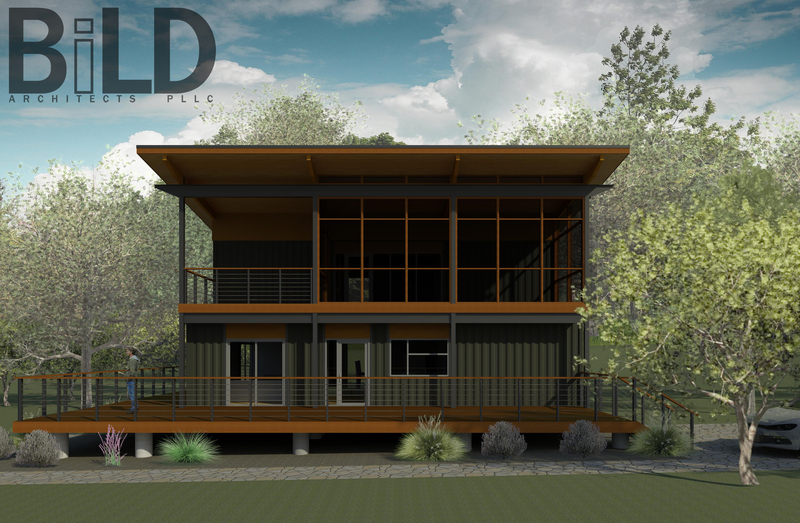 The concept for this design is based on using five 8′ by 40′ containers, three on the first floor and two stacked on the second floor, preserving the roof of the third ground level container as an outdoor porch area. On both the first and second floors, portions of the shipping container walls and floors will be removed and reinforced with steel to open up the floor plan both horizontally and vertically, creating larger living spaces. Sections of the corrugated shipping container exterior panels will be removed and reinforced to provide window openings along the North and South faces. On the container ends, the shipping container doors on many of the containers will be replaced with full height window walls to open up and frame views to the natural landscape. The second floor porch is partially open and partially screened in, oriented on the site to take advantage of the southern exposure and view. A generous roof overhang blocks the higher angle rays of the summer sun to keep the interior spaces cooler, but will allow the winter sun to penetrate through the porch and interior spaces for warmth in winter. The containers are supported by concrete pier foundations, allowing the container structure and wrap around deck to float above the existing grade, minimizing impact on the natural grades in the wooded natural setting where the house will be built. For the exterior form, the concept was to blend with the environment as much as possible utilizing color and material. 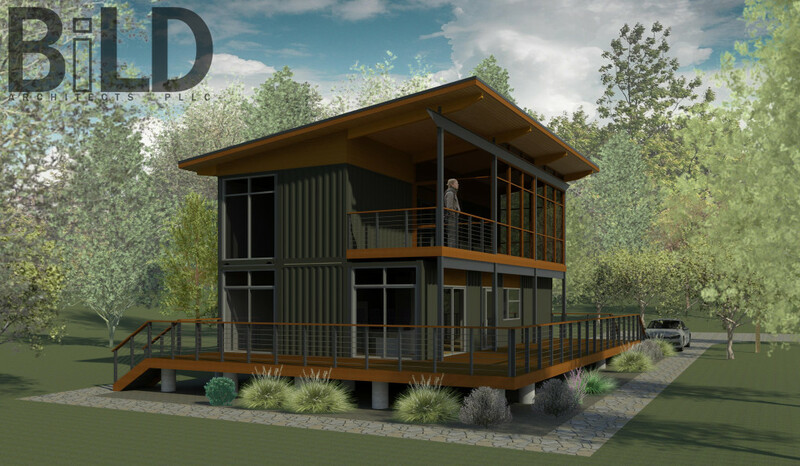 The clean manufactured vertical lines of the corrugated siding of the shipping containers will be juxtaposed with natural cedar siding and trim to tie the structure to surrounding forest. To balance the verticality of the shipping container structure and corrugated panels, a low slope roof plane with cantilevered end glue laminated beams is utilized to keep the roof structure simple while providing overhangs for the porch and window openings. The horizontal railings, porch, and deck structure also work to compliment the structures vertical nature. This project has presented us with new challenges with the use of a containers as the basic building block. We are excited to see the project progress and look forward to other opportunities to utilize this “unconventional” building block in future designs.